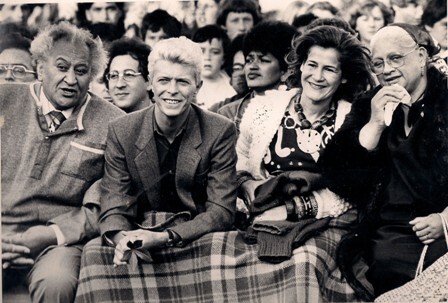 When 250 David Bowie fans the South Island arrive in Wellington for his concert on Thursday the train that brought them north will wait in Picton to take them back. For this is no ordinary train it is the Otago Excursion Train, the only one in New Zealand that can be hired.Though hiring a train may seem a costly exercise, it is becoming increasingly popular for clubs or large group of people, according to the Otago Excursion Train Trust. it has carried Young farmers to their annual conference, scout to their jamboree, and now – for the firs time – rock fans will be its passengers. Seven years ago it was impossible to hire a train in New Zealand. But train enthusiats believed there was a market for private hire. So they got together to try, to make their dream a reality. It took three years of negotiation to get the unconventional idea of hiring a train “on the rails.” But it happened. Since then the enthusiastic members of the Otago Excursion Train Trust have been working to renovate old carriages. Most of these were built about 1920. Some are as old as 1912. Many had been written off as too decrepit, But after month of work, and around $20.000 a carriage, each one of them was gradually given a new lease of life. The trust has 11 carriages and a buffet car, and can carry 480 people in all. Its home is the railway station, Where it is hoped to build a covered workshop eventually. Now the trust is also building new carriages on old rail chassis. They are not as romantic as the old carriages, but more comfortable. The lates venture is building a carriage for disabled passengers. This should be finished about Christmas, and will be the first railway carriage for the disabled in the country. it has utilised an old chassis, but is otherwise entirely designed and built by the trust. Outside, steel cladding is used for easy maintenance insaide, it will look rather like a classy tour buss, with upholestered seats. There are large windows, lower than usual, for a wide view of the country side. But there the resemblance to a tour coach ends. Some of the seats can be removed to allow wheelchair to be used and anchored by a clamping device. If the disabled person prefers to transfer from wheelchair to ordinary seat this is easy, too. The wheelchair can be taken away and stored for the journey. A ramp gives easy acces to a wide platform at the rear of the carriage, There are wide doorways into the carriage, and there will be permanent paraplegic toilet facilities. The carriage for the disabled is expected to cost $21.500. The idea for it came at the time of telethon. Subsequently a Telethon grant of $7500 was awarded to the trust towards the cost. The buffet carriage essential for the long journeys that the train undertakes, was desaigned and renovated by trust members from an old guard’s van. The first big charter was three years ago when the Otago excursion train brought scouts from the south up to Napier and Hastings for their jamboree. “This was what made us look more closely at the charter business,” said Mr Philip, full – time worker for the trust. “In fackt it is the excurtions that keep us going. They really make local runs possible. We run about 40 trips a year, and are looking at the possibility of a regular, scheduled run now,” Philip said. Mr Rockliff works in the bulk tonnage section of the Railways. He is encouraged also by the fact that the local community is behind the trust. People obviously see the tourist potencial. A local company has just given the trust $2500. The Lions Club has promised the proceeds from an auction. Since the trust is always in a state of penury – it tried to keep charges for day or weekend trips as low as possible – this local support is welcomed. “The major part of the cost of any excursion is the hire of the locomotive, guard and loco crew from the Railways,” Mr Rockliff said. ” All other personnel on the train are trust volunteers.” Enthusiasts come from all walks of life. Two of the executive commintee are women – Ruby Bamberry and Ruth Gamble. Ruby is active in organising the buffet and Ruth helps organies excursions. Many families are members.